This Christmas concerns seem a wee bit different. Phogotraphy broke and continues to run the story. In some ways it appeared much the same – a friend heard from a friend, followed by Poundland customer services initially saying they were no longer stocking it – then a bit later saying of course they were still stocking it/getting new stock/restock after Xmas. Just a courtesy reply to advise you that we will be re-introducing the 35mm Agfa Vista range in the New Year. Panic over so I thought especially as the Dumfries and Carlisle stores still seem well stocked but … what is becoming clear is dear old Poundland is struggling to source the film cheaply enough from Phogotrophy’s responses from the company. Whilst I would be happy to pay a wee bit more, Poundland have the limitation of ‘everything’s a pound’. But what might be a bigger issue is a comment on the same post by Eugen Mezei. He echoed things I had seen in part before but hadn’t put together such as the lack of other bargain C200 based films like DM Paradies on the continent. More worrying was his note that Fuji had discontinued budget 200 ASA film production -eeek !! I can’t verify his comments with any official Fujifilm news releases ( I emailed their UK press officer 2 weeks ago but still waiting). Eugen does point out that he doesn’t know if that means they’ve just stopped making branded C200 (certainly the global & US site no longer mention C200 – although still listed in the UK). I’ve emailed Agfaphoto too but it is Xmas…. So the writing may be on the wall sooner but inevitably there may come a time when the margin gets too small for Poundland. That day will be a shame to lose cheap film from the high streets, which IMHO has been no bad thing for getting folk curious about film. The rest of us will end up sourcing online for a bit more than we pay at the moment – I suspect poundland has had a fantastic volume buying position that few smaller sellers could dream of. If you search there are deals out there. You can get Poundland’s former £1 film Kodak ColorPlus for £1.69 (or a bargain £1.89 for 36exp) before postage from firstcall although postage at £7.99 means you’ll need to order a lot to keep under £2. 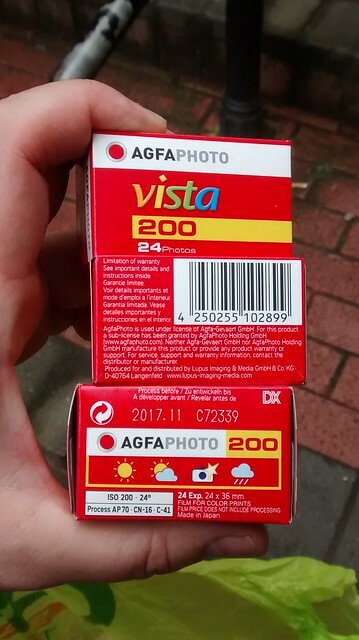 Agfaphoto vista 200 is just rebranded Fujicolor c200 and of course you can buy that for around £7 for 3x24exp rolls online (although if C200 is a goner that might not be around for long. If I hear anything I’ll keep you posted. Maybe time to pick up some!